Leather Training Articles. Perfect for Schutzhund, TDX or VST type tracking training or for use in scent discrimination exercises. Hand cut in assorted sizes. Most articles are approximately 4 inches x 4 inches and about 1/8 inch thick. 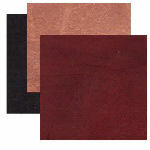 Assorted colors of Burgundy or Black Latigo or Tan Harness Leather. Contact Pawmark for larger quanties of this product.